Description of "What is your legacy? (eBook)"
Do you wonder what should you do with your life? Would life be easier if you could only get some direction? Even if people don’t chit-chat about legacies, these are questions arising during silent nights in the mind of almost everyone. Especially in those of us reaching certain life miles like adulthood, middle life and retirement. Have you ever noticed the process of metamorphosis in a butterfly? Getting out of its chrysalis is difficult and painful. You may think you’re doing it a service by cutting the upper part of its chrysalis to ease its access out of it. But if you’ll do that, the butterfly won’t have its wings well developed and it will be crippled for the rest of its life. Struggles and challenges are necessary for metamorphosis to take place. They are necessary for creating and building a legacy too. 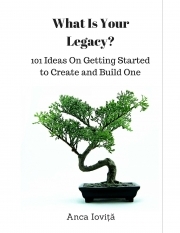 While you are the ONLY one responsible for knowing what makes you live another day in your own skin and in your own situation, this collection of ideas on getting started to creating and building a legacy could be just the right direction you need. A purpose in life is the main reason people go on no matter what happens to them in the present moment. Such a purpose makes life not only bearable, but enjoyable too. Hence my focus on this collection of ideas is for those who understand the importance of leaving a legacy behind, but haven’t got a clue of why they live and what should they do with their lives. It is an inspiring collection for creatives in general and people who never viewed themselves as creative or who never thought they could build anything worthwhile. These ideas are organized as a flashcard set and should be read and processed accordingly. Go through all these flashcards and pick one idea. Focus on it 100% before trying another one if you’d like to. On the back of each card you will find some starting points. This is how I’d start any of these projects. But these steps are not enough – you’ll need mentors, detailed information and time to practice. If you set out your heart on one of these projects, you’ll face a steep learning curve until you’ll learn the ropes and make things happen. If any of these 101 ideas inspired you, I’d love to hear from you! Reviews of "What is your legacy? (eBook)"